The location and design of the stairs is probably one the most important considerations you will have when planning a loft conversion project. The usual, and easiest, solution is to have the new staircase running directly above the existing stairs. And, in many houses, this is perfectly practical and easy to achieve though, depending on the available headroom in the loft, it may be necessary to incorporate a side dormer. Equally, if the property has a hipped roof than it will probably be necessary to convert the hip to a gable. In most properties when thinking where to locate the stairs for loft conversions there are two popular techniques. Either to run the loft stairs across the internal wall separating front and rear of the house to enter the loft sideways or, secondly, to locate the loft stairs side by side with the front to rear ceiling joists. Something that many people don’t realise before beginning to convert their loft is that the new stairs will take up a large amount of space. Because of this, choosing the best position for the stairs is something that needs to be considered very carefully. Then ideal solution is to have the new staircase positioned on the existing landing but space restrictions often prevent this. In such cases the new loft stairs will more than likely have to be located in one of the existing bedrooms and then portioned off with fire resistant walls. An alternative for those older properties that have large first floor storage cupboards or even an airing cupboard is to run the stairs for loft conversions sideways from the landing and up through the cupboard. A drawback to this method is that it may be necessary to remove a central chimney to make sufficient space for the stairs. Changes in the building regulations have made it a little easier to determine the location for the stairs. Previously, if the stairs emerged into the roof space below a sloping ceiling at least 2 meters of headroom was required. But, now the height can be as low as 1.8 meters as long as the headroom above the centre line above the stairs is at least 1.9 meters, which should apply to every loft conversion. 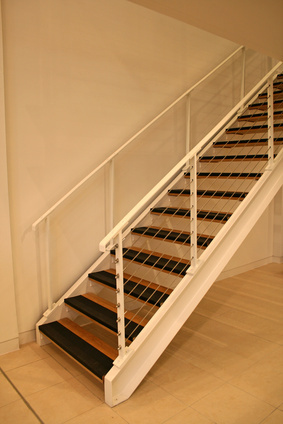 There are some alternatives to the usual straight stairs such as spiral or alternating tread staircases. Spiral stairs look great but are hopelessly impractical. Children struggle with them and moving furniture up to the loft will be a nightmare but, on the plus side, they do look very stylish. 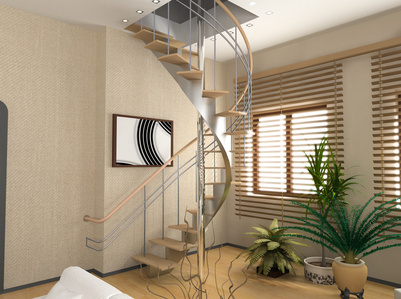 Spiral stairs are very effective in modern homes and can be a great design feature. Alternating tread stairs, also known as compact stairs, are usually to be avoided and are very difficult to get past the building control officers. Only consider this kind of stair if the room for the new loft stairs is very restricted and you can prove to the building inspector that it is impossible to fit in a traditional style flight of loft stairs.